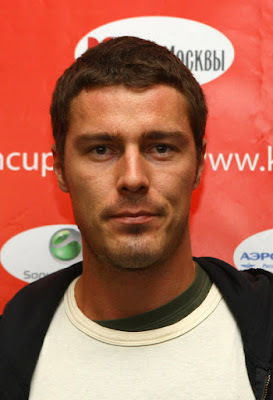 Here are some great photos at the Kremlin Cup players party at the Europe Club, Moscow, Russia last night. Enjoy! There are a few performances from boy bands and all-girl bands including this group called "Blondies". I thought I saw Maria Sharapova in this picture. 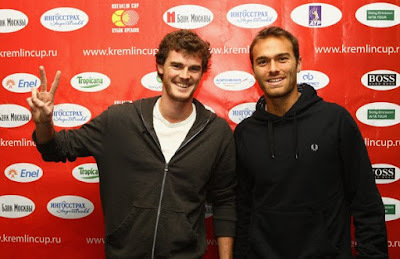 Jamie Murray (with the lame 'peace' sign) and Ross Hutchins. Anastasia Myskina and the cute looking Dinara Safina. Starace Potito and Flavia Pennetta. 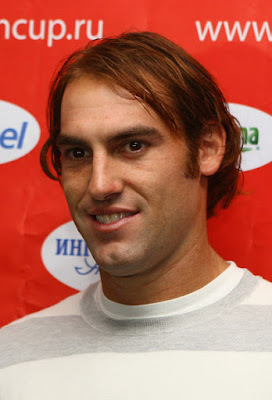 Gosh, Robby Ginepri, you seriously need to get a haircut! Elena 'hot-looking blond in leather' Dementieva. Nicole Vaidisova in a 'Wilma Flintstone' dress. Dinara Safina's pretty good in PR. Don't you think Svetlana Kuznetsova's getting slimmer and prettier these days?